6 levels of play, giving novice to professional standards. Computer moves in 2 seconds at the lowest level. Board display with coordinate entry of moves, and rejection of illegal moves. 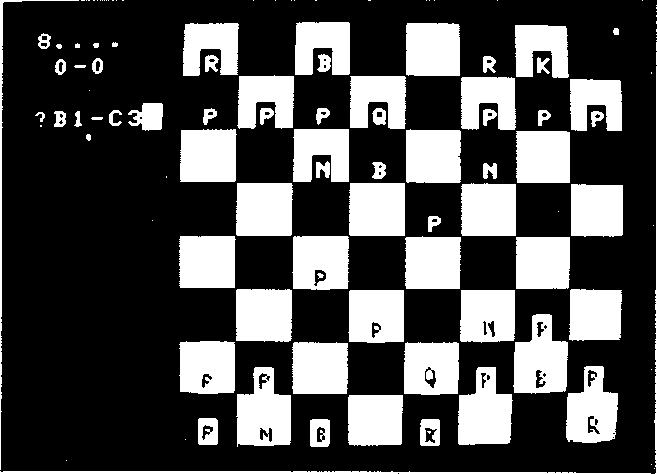 Computer and human castling (0-0 and 0-0-0). En-passant captures allowed, and played by computer. Up to 127 moves each side are stored, and can be replayed from any point in the game. A game can be restarted at any earlier point. Program 5K, graphics 6K.